Most people think of the AR15 and the M16 when they consider buying an assault rifle. However, even though they are affordable to buy, both rifles are prone to problems. The M16 will basically fire in any condition, but is heavy and less accurate. The A15 is accurate and lightweight, but less reliable. If you want an assault rifle that is both accurate and reliable consider the HK416 or the MR556. It is no secret that they cost more than double the amount of an AR15, but you do get what you pay for. They are both made by Heckler & Koch and although they are based on the AR15 platform, they are a much higher quality assault rifle. The HK416 is a military assault rifle designed for the armed forces. However, there is a semi-auto version available for civilians. The rifle uses a gas piston system with a rod that prevents propellant gases from being introduced into the weapon. This alone makes the HK416 one of the most reliable assault weapons there is. It has proven itself time and time again in various battles across the world and some army’s have adopted it as their primary weapon. Heckler & Koch use the highest quality steel there is to manufacture the HK416 barrel. It can continuously fire over 20,000 rounds without notable degrading or a reduction in accuracy or muzzle velocity. The weapon weighs around 6.5 pounds when empty and can fire 700 to 900 rounds per minute. It uses 5.56 x 45mm NATO ammunition and you can get several version of the rifle that vary in barrel length. Consider the 10.4, 14.5, 16.5, or the 20 inch barrel. There is even an OTB model which still fires after being submerged in water. 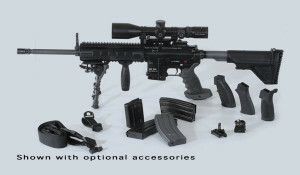 As an added bonus, the HK416 has a free-floating 4-quadrant rail system that allows you to use all of the accessories available for the common M4 such as scopes, sites, and lights. 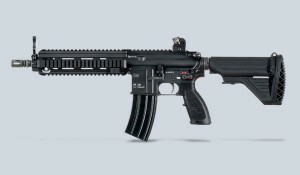 The MR556 is the civilian version of the HK416. It has a barrel length of 16.5, weighs 8.6 pounds, and uses the 5.56 x 45mm NATO. Since it is basically the same as the HK416, we will focus on the newer model that is available which has some neat upgrades. The MR556A1 still has a lot of the great features that the HK416 does including the free-floating 4-quadrant rail system that makes it compatible with all the great accessories you can get for an M4 rifle. The rail system itself also requires no tools to install or remove. In addition to this, many of the parts such as the upper and lower receiver are interchangeable with the AR15 because of the location of the take-down pins. This is a significant improvement from the original MR556. The MR556A1 has the same quality steel barrel that the HK416 does. It provides you with superior performance even under the most strenuous conditions. However, the MR556A1 has an overall superior barrel to the 416 because it does not have the chrome-lining which can affect accuracy and hide imperfections. Inside the barrel there are 6 lands and grooves that have a 1 in 7 inch twist. This improves bullet velocity as well as accuracy. To improve accuracy even further, the MR556 features a two-stage trigger and an extended latch charging handle. This also makes the rifle easier to handle. You can use a variety of 5.56 x 45mm ammunition with the 556 due to the C.I.P dimensioned chamber and it even functions with quality .223 Remington ammunition. charm. "Difference Between HK416 and MR556." DifferenceBetween.net. August 8, 2014 < http://www.differencebetween.net/miscellaneous/difference-between-hk416-and-mr556/ >. The m16 is an ar15 the same way a square is a rectangle. Ar15’s come in literally all sorts of shapes and sizes, lengths and weights, and with varying reliability. From the colt le6290, to the norinco cq, to a daniel defence m4 style carbine, to an hk416(or civilian mr556), ar15s are made to different standards and for different purposes. You can modify an ar15 to be purpose specific. The m16 and m4 are an example of this, with the later being a general purpose rifle designed for moderately close range combat, such as an urban area or even clearing a building. The m16 has a longer barrel, and is more effective at shooting far away targets, as well as putting more energy behind the bullet. The difference between the m16 and the hk416 boils down to gas impingement system and a gas piston system. The latter is said to be more reliable because it doesn’t get as dirty. Now all hk416s/mr556s ARE ar15s. There are also many piston driven ar15s that are a lot cheaper. You could build your own custom ar15 that matches an mr556, for a fraction of the price, even in Canada. If you are looking for a new black rifle, get a basic high quality ar15 for a 1000$, and use the extra 1000-2000$ to upgrade your rifle to your exact specifications. If you want something shiny, buy an XCR. Its an entirely new rifle based around the stanag magazines (same mags the ar15 takes). The HK416 had an adjustable regulator in the gas block so that you could fire suppressed, single shot (i.e. manually cycled), light training loads, or regular loads (55-75gr). The MR556A1 doesn’t have an adjustable regulator. It’s not clear if the HK416 gas block/regulator is compatible with an MR556A1. What’s the difference between a rifle and a assaults rifle?